My Dad is a healthy chap and recently gave up eating meat. He still eats fish though. 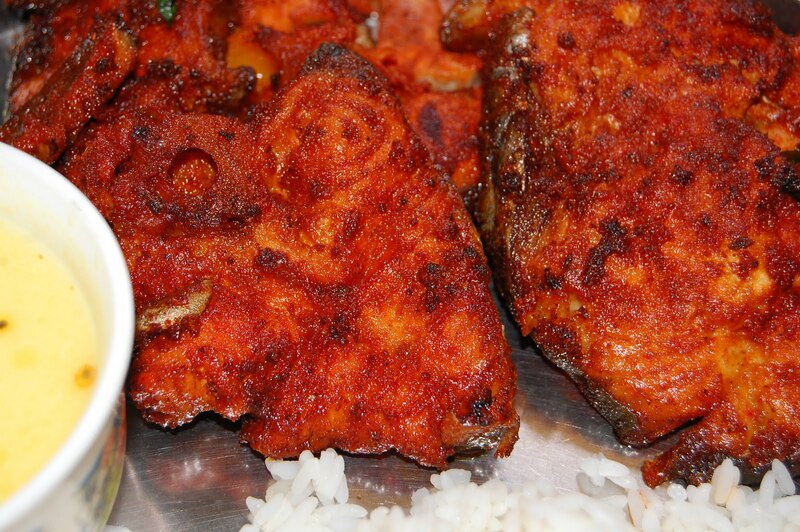 As we cannot be together this Father’s Day I’ve decided to post a very popular Sri Lankan fish recipe for him which isn’t too spicy but still full of flavour. It’s also very easy. The fish I have chosen is Seer fish. Seer belongs to the Mackerel family but I don’t find it anywhere near as oily as normal mackerel. They are pelagic fishes, fast swimmers and predatory in nature, that fight vigorously when caught. A popular game fish, Seer are mainly caught using hooks and lines. They are a delicacy in several regions of South India and Sri Lanka where it is known as “Thora” and is usually the costliest fish available at the market (nothing but the best for Pops on Father’s Day!). Seer fish are also referred to as “king mackerels” in some areas. They can grow up to 45kg (100lbs), have very sharp teeth and are handled with care by fishermen familiar with them. Mix all the ingredients and marinate the fish steaks for 1 hour. Heat oil in a frying pan, add the marinated fish in batches, fry, turning occasionally until golden brown. Serve with a large salad and garlic mayonnaise or rice and tomato & onion salsa.